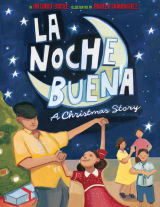 It's Christmas Eve, and tonight my family will get together for our traditional "Noche Buena" dinner. Noche Buena (Christmas Eve) is when we have our big celebratory dinner with all the trimmings. All our family and friends who don't have close family in the area eat, toast, and dance (yes, dance) and celebrate while teasing the kids as they wait on pins and needles for Santa to show up after midnight. Of course, we borrowed Santa. Traditionally, Santa Claus was not part of our culture. It used to be that the kids had to wait until January 6th, El Dia De Los Reyes or Three Kings Day, to receive presents. I remember leaving water and grass for the camels, and something special for "my" King -- we each chose our own. I used to love that anticipation when I was a little girl. The celebration is usually done by midnight when adults exchange gifts and children (if they're awake) receive a token. They still have to wait until Christmas morning to find out what Santa left for them. Some adults go to a midnight service, others celebrate a bit longer, and still others will go home to get ready for Christmas day. It's a long night! A beautiful night that we look forward to all year long, and a cultural tradition that we have passed along to our children throughout the years. Antonio Sacre is a Cuban-American writer, storyteller, and performance artist. He lives in Los Angeles. Visit him online here. Angela Dominguez was born in Mexico City and lives in northern California. She illustrated Ava Tree and the Wishes Three and Carmen Learns English. Visit her online here. Merry Chrisrmas, Hilcia. It sounds like your family traditions create a lovely, warm holiday, full of wondeeful memories. Enjoy! I'm doing noche buena too! Tomorrow is all about my mom's birthday, but today is the big family thing. This year is only the five of us - Mum, Daddy, Sister, Rocco (our dog) and me. We'll probably watch tv and eat early. It's our way. Alex! I hope your Noche Buena was as wonderful as mine. Merry Christmas! (Belated) Merry Christmas! PC time has been sporadic. We celebrated the Three Kings as well. It wasn't until I had Lili that we started celebrating Christmas. She was born on Jan 6, and we wanted to celebrate her birthday separate than the holidays. We may go back to that though. It felt more... loving, familial than these Christmases of now. Thank you, Nath. We had a wonderful time! It was a warm, relaxing and beautiful Christmas Eve. Christmas Day was lazy and just about perfect for me. *g* Stress-free! Perfect!